This classic cabled bag will look great with that winter sweater. Made on the Knifty Knitter Green round loom, you too can create beautiful cables on a regular gauge knitting loom. 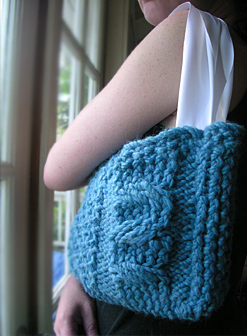 The bag pictured uses Lion Brand Thick N' Quick yarn in color "Sky Blue". Color pictures and detailed written instructions and charts are included in the pattern. This pattern includes instructions for adding the lining and handles. Stitch Techniques: Cabling, e-wrap, purl, flat panel method bind off, advanced stitch patterns and charting, and basic sewing skills for the lining.